Provided the weather outside isn’t too frightful, there plenty of places to enjoy the finer points of the Tacoma area’s winter wonderlands. Whether you’re looking for an all-day adventure in almost-distant lands or simply a low-impact afternoon of winter weather activity, we’ve got you covered. All it really takes to go sledding is a hill, a smooth seat and a few inches of snow. For those who are looking for a slightly more trussed-up version of this simple pastime, there are plenty of places to choose from that offer a little more curb appeal than your own backyard. Designated areas in Mount Rainier’s Paradise region are prime tubing and sledding real estate. It’s important to note that sledding outside of this spot is strictly prohibited for rider safety. In order to protect the meadows that lie dormant beneath the snow, only soft sleds are allowed: inner tubes, plastic sleds and saucers are okay, but toboggans or sleds with metal feet are not permitted. 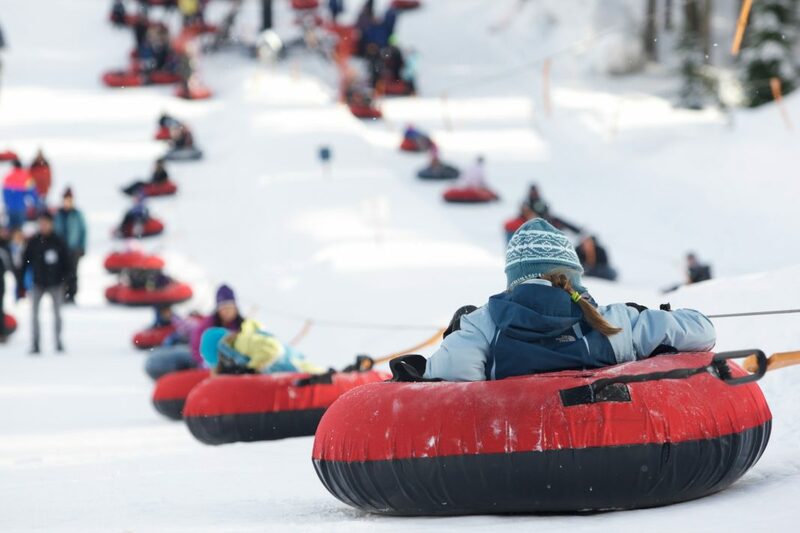 Recommended for ages three and up, the Summit Tubing Center at Snoqualmie is a destination where sledders are sure to find snow. A rope tow makes quick work of returning to the top of the hill so families can get the most out of their two-hour passes. 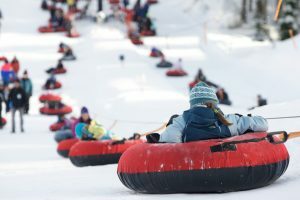 Leavenworth’s tubing hill offers complimentary tubes, a convenient tow rope and 100 feet of slipping-and-sliding fun. Commonwealth Basin and Denny Creek are both relatively unpopulated areas this time of year, and both make for an epic place to sled and tube away from the madding crowd when the weather is right. There are those who look forward to cross-country and downhill skiing, skijoring and snowboarding all year long. They’ll tell you that Washington’s largest and highest-elevation ski resort, Crystal Mountain, is your best bet for not just skiing and snowboarding, but also snowshoeing and sledding. High-speed lifts translate to more time on the slopes, and an eight-passenger gondola takes riders from the base to the state’s highest lift-accessible terrain. One of the closest ski and snowboard destinations is Stevens Pass, located in the Cascade Range. With plenty of bowls, glades and faces, the pass offers a range of terrains that’s ideal for all ability levels. Plenty of dining options on-site make this spot ideal for making a day of it after you’ve worked up an appetite on the slopes. Leavenworth offers some scenic skiing and snowboarding spots, too; check out the nearby Mission Ridge Ski & Resort. Methow Trails is home to the nation’s largest cross-country ski area and offers over 120 miles of trails where kids 17 and under ski for free every day. Other great areas to shred include Mount Baker, which averages the most snowfall per year of any mountain on Earth and is home to the largest snowboard race in the world, the Legendary Banked Slalom. 49 Degrees North is another favorite for powder hounds, boasting seven lifts, 2,325 acres and a whopping 82 trails. For those who might be new to the slopes, the resort offers lessons, daycare, a terrain park and plenty of dining options located just off the slopes. Nothing says winter magic like lacing up a pair of skates and practicing your figure eights. The temperature doesn’t get low enough in the Evergreen State to create many frozen lakes (well, none that are safe enough for skating), but there are other options available. Outdoor skating rinks provide shelter from the elements and a well-lit area to help keep skaters from taking a tumble. Most arenas are located just minutes from major freeways, which means that this kind of winter play doesn’t require a day trip. Most skating rinks run from November to January, however, Tacoma’s very own Sprinker Recreation Center has an indoor ice skating rink that’s open all year round. 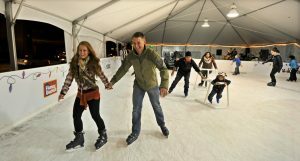 The Tacoma Art Museum transforms Tollefson Plaza into Polar Plaza during the holiday season, creating an outdoor skating arena perfect for family-friendly fun. Live music creates a festive atmosphere, and families can take advantage of a kids-only skate session to give new skaters room to practice their moves. Kids can take in a skate session at Redmond Town Center Skating Rink while parents get a little holiday shopping done. A carousel, holiday train ride and visit with Santa make this Seattle-area rink a great place to make holiday memories for families and children ages five and up. Bellevue Magic Season Ice Arena is the largest skating rink in the Washington area and is located in Bellevue Downtown Park. Skating lessons are available free of charge, and weekly fee-free days make this rink an affordable adventure for groups and families. Carolers and ice sculpting exhibitions bring a particularly festive atmosphere to the Seattle Center Winterfest Ice Rink, and art installations offer a diversion when skaters are ready to catch their breath. With its classic Bavarian architecture and breathtaking views, Leavenworth is an incredible daycation spot for Pacific Northwesterners year-round. Heavy snowfall during the winter months lend this quaint town a little extra festive appeal during the winter. More than 150 miles of worth trail are just waiting to be explored in these scenic hills. Destinations with anywhere from 2,500 to 7,000 feet in elevation and an average of 50 inches of snowfall per year make this trip a national snowmobiling destination. Kick up some snow in Winthrop to enjoy breathtaking views and nearly 200 miles of curated trails. Bring your own vehicle or rent one in town to experience a winter adventure in the fast lane. As is the case with snowmobiling in state parks, be sure to check up on day-use permits and keep fees in mind. Metro Parks Tacoma, located right in the South Sound’s own backyard, offers outdoor adventures like snowshoeing suited for all ages. There is an adults-only excursion as well as a family-friendly option, and these outings are organized annually. Snowshoes and transportation to and from is provided, although anyone interested should bring a sack lunch, water and snacks as well as sturdy boots well-suited to a day of snow play. 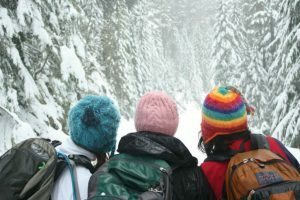 Ranger-led guided snowshoe hikes are available in Mount Baker-Snoqualmie National Forest, Mount Rainier National Park and Mount Saint Helens. Eager to see a little winter wildlife and try some light snowshoeing along the way? Register for a free Winter Wildlife Tour at the Leavenworth National Fish Hatchery, held Friday through Sunday from January to February. Snowshoes are provided, but be sure to make your reservation in advance. There are plenty of destinations far and wide that offer wide open spaces and scenic views tempting enough to warrant a brisk slog through the snow. Washington Trails Association is any outdoor enthusiast’s best friend when it comes to choosing the spot that’s right for your skill level, but there are a few that offer a little bit of something for everyone. Count on views of snowcapped trees on the beginner-friendly trek up to Mowich Lake, where the usually crowded lake is still and calm. Views of the lake flanked by snowy trees as well as Tolmie Peak, Paul Peak and Mount Rainier make this 10-mile jaunt a beautiful one. Mazama Ridge offers a relatively straightforward trail that rewards adventurers with incredible views. Hurricane Ridge, the most easily accessed area of the Olympic National Park, offers more great views and an easy-to-navigate trail for newcomers to snowshoeing. Hurricane Hill delivers all this as well as a vantage point that overlooks the San Juan islands on a clear day. Okay, this one isn’t really snow play. But, c’mon, who doesn’t want to take a sleigh ride? 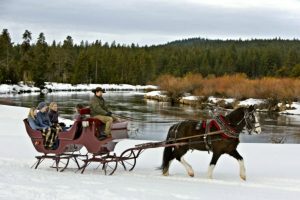 Leavenworth, leading the pack again on offerings to create a memorable winter season, has a few sleigh rides on offer. Red Tail Canyon Farm employs Belgian and Suffolk draft horses to guide Victorian-era sleighs over the river and through the woods, all bundled up under a toasty blanket. A free shuttle is also available to whisk you and yours away to Icicle Outfitters. Here a team of trusty horses and experienced driver navigate a 1.5-mile trail that traces Icicle River and sits beneath the shadow of the Stuart Mountains. Also out of Leavenworth comes a sleigh ride and hearty meal hosted by Mountain Springs Lodge. A pricier alternative to its counterparts, this sleigh ride is one to remember with a big breakfast or dinner and wintry lark for dessert. If you’re all Leavenworthed out, Cle Elum’s Suncadia Resort also offers up tours via horse-drawn carriage. This spot is great for families or couples looking to make a day of winter adventures by sticking around for Winterfest. Activities during this holly-jolly extravaganza include 20 minute-long Percheron horse rides that leave every half hour, plenty of sledding opportunities and unforgettable views of the snow-covered scenery. Sun Mountain Lodge in Winthrop, home of the largest cross-country ski slopes in North America, is also the home of hour-long sleigh rides that traverse the Cascade Mountain area for picture-perfect vistas. Each ride in this list ends with a piping hot cup of cocoa that’s enjoyed around a rustic fire or vintage stove to round out the ambiance. If you want to get your Frozen on and simply build a snowman, there’s a great opportunity to take a day trip and save on gas through Metro Parks Tacoma. Take advantage of dates in January, February and March and explore the scenic vistas and snowy terrain of Mount Rainier with family and friends. Space is limited for these outdoor adventures, and participants will have the chance to sled, snowshoe or just practice their snow angel game. Before you go, always remember to take adverse weather into account. Snow is much more fun to frolic in than it is to drive through; make sure that you get your car checked for winter safety to avoid travel woes. Dress warmly, bring snacks and keep your vehicle equipped with emergency supplies.